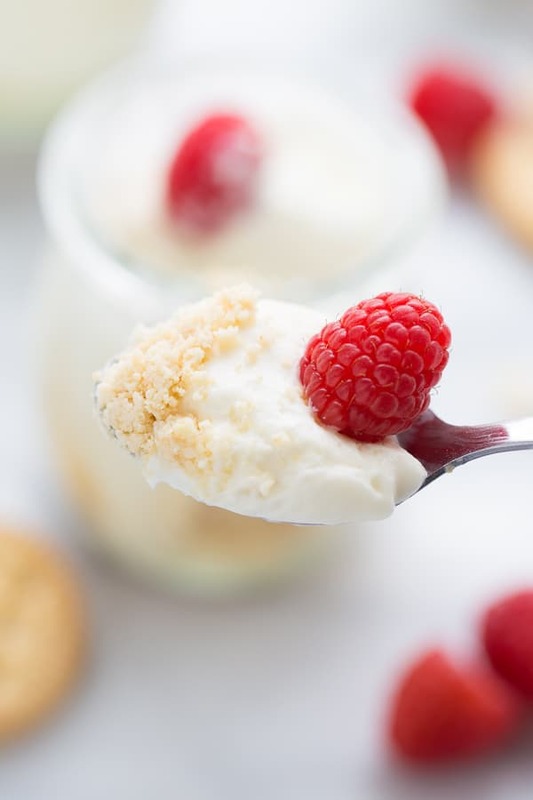 Gluten-Free Mini No-Bake Cheesecakes! An easy, decadent summer dessert! 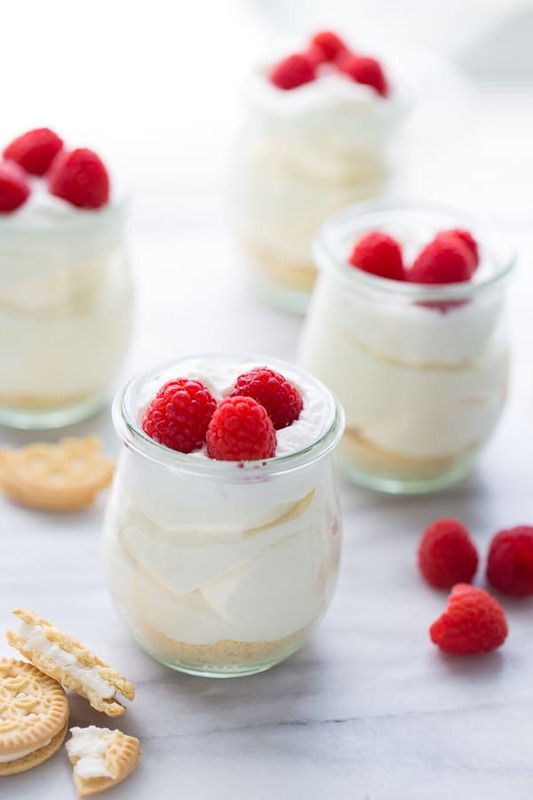 It’s hard to beat a creamy, whipped no-bake cheesecake for dessert in the middle of summer! 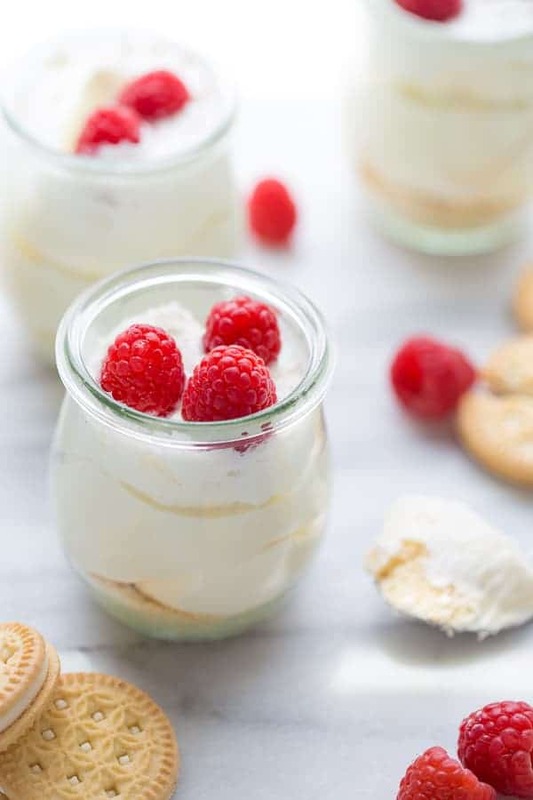 These mini no-bake cheesecakes are the easiest cheesecake you’ll ever make and make great individual desserts for parties (or just for portion control because they are so irresistible!). 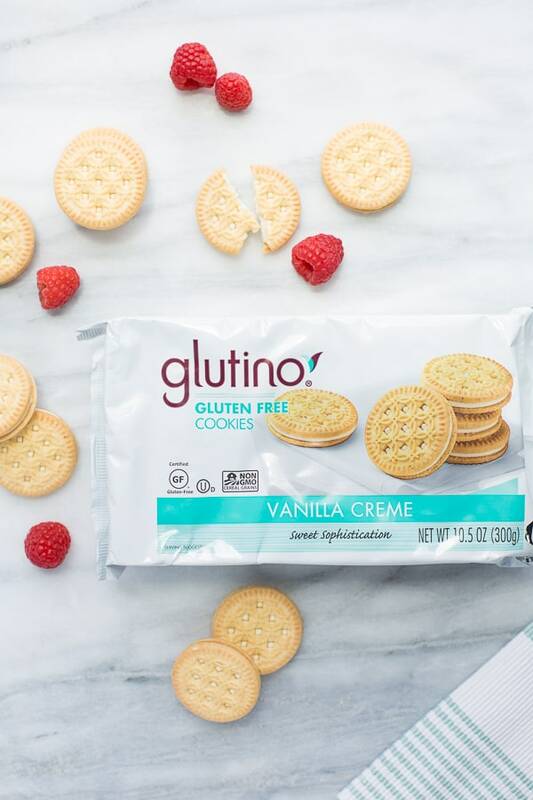 The crust is a simple, 1-ingredient cookie crust made of Glutino Vanilla Creme Cookies. Those cookies are addicting and don’t usually last long at my house! I have to hide them if I’m planning on using them in a recipe like this. I pulse the cookies up in my food processor until they form a fine crumb and the creamy cookie filling helps everything stay together. 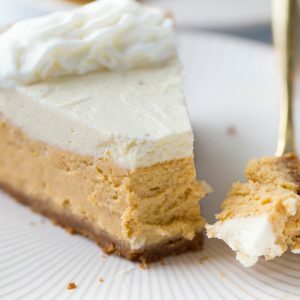 The cheesecake filling is some of the best cheesecake I’ve ever had (no-bake or not) and is all whipped together in one bowl. You can make these in individual glass containers or in a muffin pan lined with parchment liners. When making them for kids, I like to make these in a muffin pan. My kids think its so fun to get their very own cheesecake for dessert! These cheesecakes are great with any topping cheesecake topping you like. 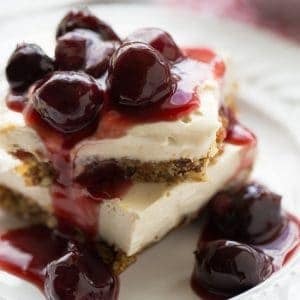 I’m definitely partial to cherry topping on cheesecake (you can use the cherry topping recipe from these No-Bake Vegan Cheesecake Bars – a great option if you can’t eat dairy!) but any kind of berry topping will work. Enjoy! These individual desserts are perfect to serve to guests! Place the cookies in the bowl of a food processor. Process until the cookies are evenly ground into a fine sand. In a large mixing bowl, add the softened cream cheese and powdered sugar. Using a hand or stand mixer, beat the mixture until incorporated. Add the vanilla and sour cream and mix to combine. With the mixer running on low, slowly add the heavy whipping cream. Increase the speed and whip until very thick and fluffy, about 4-5 minutes. Use small glass containers or line a muffin pan with baking liners. Sprinkle 2-3 tablespoons of the cookie mixture into the container or muffin pans. Press into an even layer. Top with the cheesecake mixture to fill the container. Refrigerate for 4 hours or up to overnight. Serve with fruit or fruit sauce for topping. Enjoy! 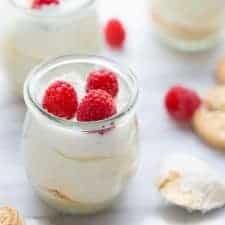 You can make these mini cheesecakes in small glass containers or in a muffin pan. If using a muffin pan you'll want to line it with parchment baking liners. 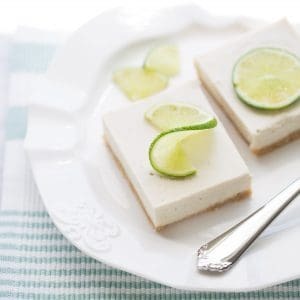 These cheesecakes can be made up to 1 day in advance! What is the shelf life on these yummy looking little cuties? They should be good for up to a day in the fridge! You can make them the night before you serve them but not much further in advance. There is just the two of us, can these be frozen? Recipe looks awesome!I bought low fat sour cream by mistake, do you think it will work? I think that should work! Let me know how it turns out. These are so cute and perfect for parties! We made these for my baby shower and they were a HUGE hit!